Ohio Wesleyan University’s Department of Theatre & Dance will present four performances of “Royal Gambit” from Feb. 15-18. Here, King Henry VIII, portrayed by OWU student Daniel Haygood, is surrounded by his six wives, portrayed by OWU students Rose Jonesco, clockwise from bottom left, Doris Ottman, Anna McReynolds, Emma Antal, Kacie Iuvara, and Nyjah Cephas. Romance, rebellion, back-stabbing intrigue, scandal, and betrayal. 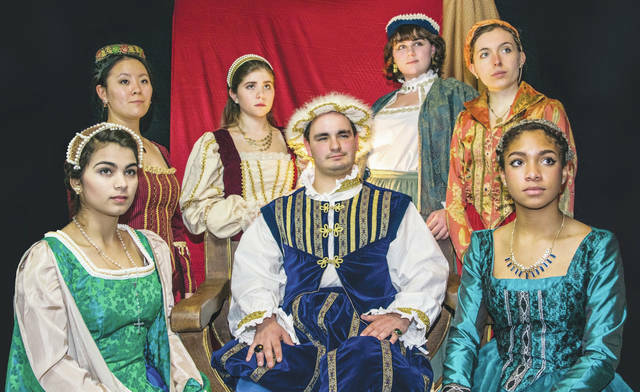 All are part of Ohio Wesleyan University’s upcoming play “Royal Gambit,” — a riveting, royal drama that details the legacy of King Henry VIII and his numerous wives. OWU’s Department of Theatre & Dance will present four performances of the Hermann Gressieker play, translated and adapted by George White. Show times are 8 p.m. Feb. 15, Feb. 16, and Feb. 17, with a Sunday matinee at 2 p.m. Feb. 18. Henry VIII served as king from 1509 until his death in 1547. In addition to six marriages, he is remembered for his effort to have his first marriage annulled and for the English Reformation (separating the Church of England from papal authority) when the annulment was denied. More than 40 Ohio Wesleyan students are participating in the production of “Royal Gambit.” The cast stars senior Daniel Haygood as Henry and features Emma Antal, Nyjah Cephas, Kacie Iuvara, Rose Jonesco, Anna McReynolds, and Doris Ottman as his wives. Scenic design is by Otterbein University professor Rob Johnson, lighting design is by Chad Knutson, and costume design is by Jackie Shelley. Ohio Wesleyan senior Adriana Rodriguez is serving as stage manager. “Royal Gambit” will be performed in the Studio Theatre of OWU’s Chappelear Drama Center, 45 Rowland Ave., Delaware. Tickets are $10 for general admission; $5 for senior citizens and non-Ohio Wesleyan students; and free for Ohio Wesleyan students and employees with a valid OWU ID. To reserve tickets, call the box office at (740) 368-3855. Seating is limited.